Seth MacFarlane is the producer of Family Guy, an American animated television series which is centered on the Griffins, a dysfunctional family . The Family Guy cartoon had the premiere on FOX in 1999. The story is centered around the adventures of a Rhode Island family, living in the fictional town of Quahog. The family includes the father, Peter Griffin, a blue-collar worker who is employed at the Pawtucket Patriot Brewery. Peter lives with his wife Lois Griffin and their three children: Meg, Chris, and their extremely intelligent baby Stewie. The family also has an anthropomorphic talking dog named Brian, who is Peter Griffin’s best friend. The Family Guy cartoon often delivers its humor through short cutaway gags, which are short clips that poke fun at the story. Family Guy has been nominated for 12 Primetime Emmy Awards and 11 Annie Awards, and has won three of each. It has garnered three Golden Reel Award nominations, winning once. In 2009, it was nominated for an Emmy for Outstanding Comedy Series, the first time an animated series was nominated for the award since The Flintstones in 1961. 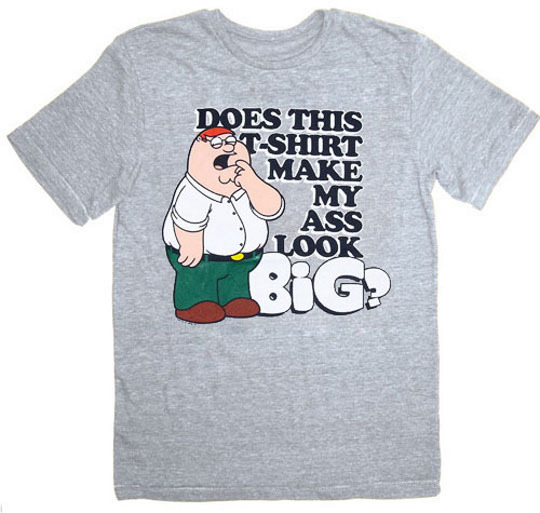 Below, you will find some of the best Family Guy t-shirt designs for almost every member of the Griffin household. Popular tees includes the Stewie t-shirt and the Peanut Butter Jelly Time Family Guy t-shirt,and many others. Are you a fan of Family Guy?If the answer is yes,than i’m sure that you can’t leave this post without taking at list one t-shirt design. Enjoy the t shirt designs and have fun! These are my thoughts precisely. I have been inspired by the things you said in this. I can honestly say things look a lot apparent now.